» » […] Did you use an infusion pump or an infusion bottle / drip chamber? » so, the dose is not lost. » » » » 2. only if you lost nothing […] the Cmax and AUC will equal the one with a constant rate infusion. » » » […] if the dose is not lost, can i say just the AUC will be effect but the Cmax is the same with the canstant rate infusion? » » Read again what I wrote above. » So, you mean the Cmax and the AUC both will equal the one with a constant rate infusion? » Don't we need to consider the eliminate rate? Why? Elimination is independent from any kind of input. » if we speed up the infusion rate while the eliminate rate is not change, the Cmax won't be greater than the constant rate infusion? ▬▬ D=1 with a constant infusion rate of 2 h–1 (i.e., infusion time of exactly 30 minutes). 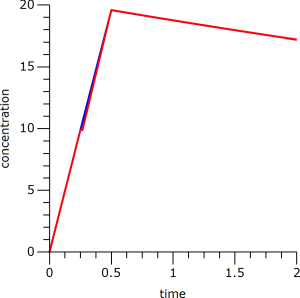 ▬▬ D=0.5 with a constant infusion rate of 2 h–1 (i.e., planned infusion time of exactly 30 minutes). Infusion completely stopped after 15 minutes for five minutes. 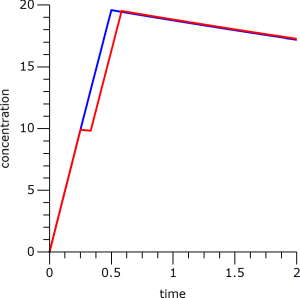 Infusion of the remaining D=0.5 resumed at 20 minutes with an accelerated infusion rate of 3 h–1 (i.e., infusion time of exactly ten minutes). to adjust an accelerated infusion rate properly. ElMaestro had valid points as well. With an accelerated infusion rate you may run into safety problems. » Does the Cmax should be excluded? What about the AUC? What should the investigator to do if the same situation (need to stop temporarily or need to change the infusion speed) occurs next time? For the next time I strongly recommend infusion pumps (yeah, I know, expensive): Exact infusion rates, no bubbles, no problems. If you would have kept the original infusion rate (after the five minutes stop), i.e., complete it at 35 minutes, you would have seen a Cmax which is 0.35% (!) lower than expected with the planned schedule – if you have an early sampling time point. If not, you will observed a lower Cmax. How much lower depends on the sampling schedule and the elimination rate. Theoretically the AUC is not affected (depends only on the dose). online 17 (0 registered, 17 guests [including 12 identified bots]).